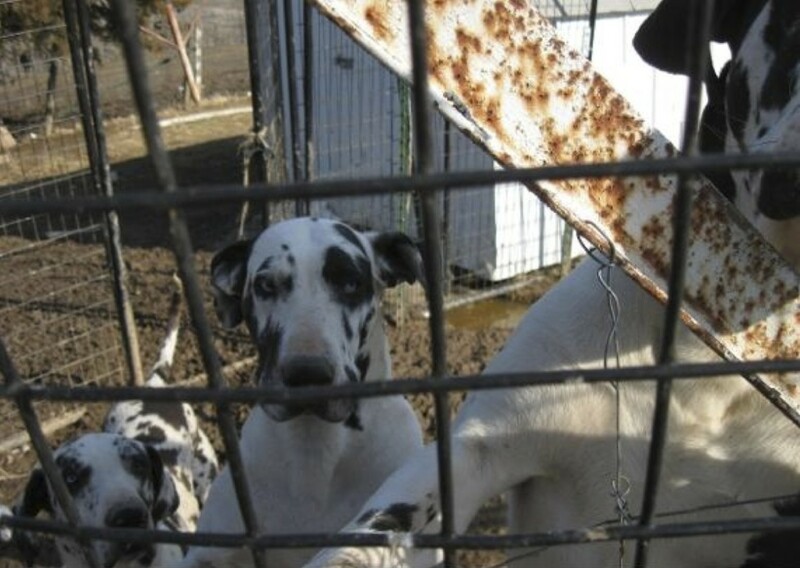 Photo of “Okie” (left), “Jenny” (middle) and “Foot” (right) at former dog breeding facility owned by Debra Pratt near New Sharon, Iowa, in this photo taken March 26, 2013, during an authorized USDA Animal and Plant Health Inspection Service investigation. Iowa Department of Agriculture and Land Stewardship officials revoked Pratt's permit to operate the facility after repeated violations uncovered in USDA inspections. Critics said it kept activists, reporters and other citizens who wanted to expose unhealthy conditions for animals from learning about those conditions and reporting them. The Animal Legal Defense Fund; Iowa Citizens for Community Improvement, which acts as a watchdog on factory farms; Bailing Out Benji, a nonprofit organization for dog and puppy protection; People for the Ethical Treatment of Animals (PETA); and the Center for Food Safety sued in a petition filed by ACLU Iowa. The Iowa Center for Public Affairs Journalism, which runs IowaWatch, joined the Iowa Freedom of Information Council in an amicus curiae, or friend of the court, filing supporting the lawsuit, saying the law restricted newsgathering by journalists. IowaWatch has done reporting on dog breeding facilities that violate animal health laws. “Undercover investigations have been a long part of journalism in the United States and I’m grateful to see the court recognize that,” Randy Evans, executive director of the Iowa Freedom of Information Council, said at a Des Moines news conference. Defendants were Gov. Kim Reynolds, Attorney General Tom Miller and Montgomery County Attorney Bruce Swanson. Former Gov. Terry Branstad signed the law after the Iowa Legislature passed it. Gritzner’s ruling granted the plaintiffs’ request for summary judgment in their favor and against the defendants’ request for judgment in their favor. Gritzner said in his ruling that Iowa’s law, in effect, implicates First Amendment rights because you could not break the law without engaging in speech. He said the law effectively criminalized undercover investigations of certain agricultural facilities, like puppy mills. And, he wrote, the law was similar, and in parts identical, to laws in other states that regulate conduct and speech about agricultural operations. Gritzner wrote that the state had shown no evidence that the law’s prohibitions would protect perceived harm to the ag facilities or biosecurity. He cited incidences of lawmakers saying they wanted to curb activists from spreading damaging or false information about the facilities and agriculture production practices. “Plaintiffs and their amici – the Freedom of Information Council and Iowa Center for Public Affairs Journalism – frame this legislative trend within the context of an on-going tension between members of the news media and the agriculture industry,” he wrote. The Freedom of Information Council and Iowa Center for Public Affairs Journalism brief in support of the lawsuit stated that the public wants consumer news about the food they eat and how it is produced, but that the Iowa law hampered reporting unflattering news. Under the law, a first conviction would be a serious misdemeanor while a second conviction would be an aggravated misdemeanor. Bailing Out Benji executive director Mindi Callison said the ruling was groundbreaking. “Because of it, hopefully other states are able to overturn their ag-gag laws,” Callison said. Federal courts also have struck similar laws in Idaho, Utah and, late last year, Wyoming, and a case challenging a restrictive law in North Carolina is pending. This IowaWatch story was republished by the New Food Economy news website, IowaInformer.com and the Midwest Center for Investigative Reporting under IowaWatch’s mission of sharing stories with media partners. As the U.S. Environmental Protection Agency prepared to make label changes for the herbicide dicamba after it caused widespread crop damage, the agency depended on the herbicide’s maker for guidance, documents produced in a federal lawsuit show. A review of more than 800 pages of documents from a lawsuit filed against the U.S. EPA in January 2017 highlight the process behind how the agency made the label changes.